Might and Delight invites you to step into an interactive diorama that expands on the world of Paws and Shelter 2. Welcome to The Lonesome Fog! 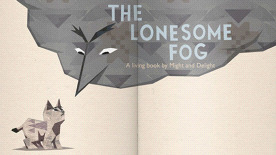 The Lonesome Fog is a living book that seeks to expand on the concept of storytelling and explores the plight of a young cub trapped in a cycle of fear, cowardice and uncertainty. What becomes of you when you let fear dictate the way you live your life? The roughly twenty page living book hopes to uncover that. Well established sounds and tracks from the Shelter series. Environmental elements such as trees and water will be brought to life. Seamless animated page transitions add depth and character to an already detailed experience. LEGAL: © 2016 Might & Delight™. Trademarks belong to their respective owners. All rights reserved.